Kristin Gablehouse came back from a brain injury to run a 100-miler, but her battle continues. Photo by Joshua Lawton. A 400-mile bike tour from Vienna to Venice was Kristin Gablehouse’s idea of a perfect vacation with her cyclist husband. 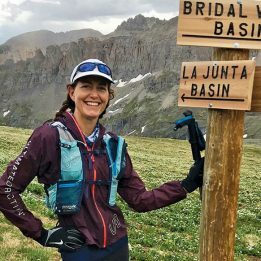 The pair had been planning and saving for the two-week trip for years, and the 37-year-old, experienced trail runner was in the best shape of her life when they left their Boulder, Colorado, home in August 2015. The first few days of the trip went just as planned: they biked in a small group, mostly along country roads, heading south through Austria. Then on day six, nearly halfway to Venice, a dog darted out of a nearby driveway directly in the path of Gablehouse’s front tire. But, sitting on the side of the road, she couldn’t see. She couldn’t stand. She figured she was in shock, but her companions insisted she go the hospital. Seeing no fractures, though, doctors told her she was free to go. Dirty, sweaty and tired, Kristin decided to shower before heading to bed, hoping she’d feel better in the morning. She stepped into the shower, tilted her head back under the water and passed out. She came to almost immediately, shaken. Gablehouse finished the bike trip from Vienna to Venice, but, still feeling off back home, had a CT scan, which came back clear. A concussion maybe, her doctor said, but nothing to be too concerned about. In November 2015, three months after the accident, a neurotrauma doctor diagnosed Gablehouse with a mild traumatic brain injury (TBI). The difficulty with TBI, says Gablehouse, is its subtlety. A Colorado native and the only girl between two brothers, Kristin had been a runner and cyclist for years before the European trip. She had run cross country in high school, and gotten back into running while doing a rotation as a veterinarian at Washington State University. She fell in love with the trails of Moscow Mountain just across the Idaho border, calling it her escape. Later, a friend suggested a 25K trail race. 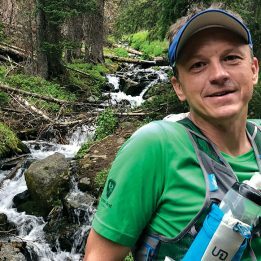 Gablehouse was immediately hooked, stepping up to a trail marathon, and then races as long as 50K and 50 miles. Months before her accident, Gablehouse had set a goal to run the Run Rabbit Run 100-miler in Steamboat Springs, Colorado, in September 2016, but her injury had completely derailed her training. In fact, she didn’t know if she’d ever run again. After returning home, she suffered two blood clots in her lower legs, and knew she’d need to keep moving to prevent another, but therapists told her not to raise her heart rate over 120 beats per minute. At first, she could barely shuffle around the block. But after a couple of months, she added intervals of jogging: a few yards at a time gradually grew into a mile or two. Mapping out her training, Gablehouse realized she could still conservatively increase her mileage enough to be ready to race in September. By summer of 2016, Gablehouse had worked up to 60-mile weeks. Gradually, that increased to 80. Then, the taper began for Run Rabbit Run. Kristin never lost her resolve, but she had doubts. “I really thought by going that far and staying up all night, my brain would just start melting,” she says. She started the race according to the plan she’d worked out with her coach: slow and steady. For 80 miles, it worked. She ran through the night, stopping under a full moon to turn off her headlamp and gaze at the stars. It was meditative, transcendental, she says. But in the last 20 miles, a nagging ankle injury flared up and made running nauseatingly painful. Josh, who often acts as part of her crew, came out to join her. Using him as a crutch, Kristin ran flat sections and walked the hills. They lost a lot of time, and the 36-hour cutoff loomed. 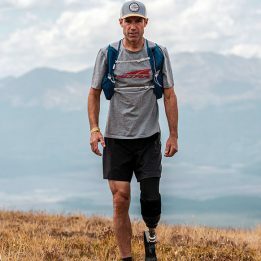 When they reached the top of Mount Werner and looked down toward the finish in Steamboat Springs three miles away, they had just over half an hour to get there. Her brother and some friends hiked up to meet them as they descended toward Steamboat. With a mile and a half to go and 35 minutes to get there, a few more friends joined them. And, with just 14 minutes to spare, she crossed the line. Recovering over the next couple days, she wondered if the race had somehow “fixed her.” But soon, her TBI symptoms crept back. Now, two years post-crash, Gablehouse continues to make gradual improvements, but she still can’t drive at night or for longer than 45 minutes at a time. She continues vision therapy to help with reading and with motion sensitivity, and has so far only been able to manage a few short shifts back in the veterinary clinic where she works, just outside of Boulder.